The Fed Shows Class Bias? In general, the “class glass” is a poor lens for analyzing U.S. politics and macroeconomic policies. To be sure, the nation has interest-group politics in spades, and groups are often well-financed. And certainly, whenever past Dallas Fed President Richard Fisher sallied forth there was the potential for embarrassing spectacle, as when he held a press conference to condemn wages rising faster than prices. Or to warn that rising prices of antiquarian collectible books harbingered an inflation that merited a tighter monetary noose immediately. But, in general, does Fed monetary policy exhibit class bias? Think about two aspects of Fed policy: The Fed appears committed to keeping (at a minimum) about one out of 20 Americans who want work to being unemployed, and now has committed to paying 0.50% interest on excess reserves (IOER), regardless of how much capital is surplus. On jobs, the picture may be worse than at first blush. According to JOLTS data there are 5.3 million job openings in the U.S., but the number of unemployed is 7.9 million at latest read, and that excepts the millions who have given up looking for work. There are still, in aggregate, more people who want work than available jobs, and this appears at least partially the result of official Fed policy. People who want to work get to play musical chairs. No class bias? Would the AFL-CIO endorse such a policy? Would any job-hunter? On IOER, the question can be asked, “Have those with money to save demanded a return on ultra-safe short-term savings—market forces be damned—and has the Fed complied?” To be sure, there has been a constant chorus from some quarters that the Fed is engaged in “financial repression”—that is, holding down interest rates. There is a vocal, influential tribe in the U.S. that at any moment calls for tighter money, with the servile organ of The Wall Street Journal op-ed page ever available. An earnest question cuts the other way as well. Without the Fed’s “reverse repo” program, what would be short-term interest rates today? Rates are negative through much of the developed world. Of course, the proposition that the Fed’s 0.50% IOER is merely interest group politics, and capture of regulatory agency (the Fed) by the regulated (the banks) is a viable one as well. The policy-making Federal Open Market Committee does not have a “labor” seat, or seats from the manufacturing, real estate, agriculture, or tourism industries. To say the financial industries are influential at the Fed would not be provocative. Do influential financial industries create proxy for class bias at the Fed? From the St. Louis Fed, here are the PCE Deflator figures, chain-type index, for the last two years. It shows a 1.54% increase in prices in the last eight quarters. That is not per quarter; that is total. That is about 0.75% annual inflation, or not even 1% annual inflation. The Fed has proposed four rate increases in 2016. Really? Macroeconomics should be about aggregates, not components of spending. Yes, changes occurring in the various components of GDP can impact interest rates, and thus velocity. And if monetary policy is inept (i.e. doesn’t offset changes in velocity) that can impact nominal spending, but it certainly isn’t the most illuminating way of looking at the issue. It’s like trying to explain changes in the overall price level by modelling changes in the nominal price of each good—theoretically possible, but a waste of time. The biggest risk is that a set of bad events elsewhere in the world could cause the trade deficit to deteriorate further. Hutchins’ Fiscal Impact Measure shows sluggish government spending contributed to weak fourth quarter GDP growth. Clearly not what you could call a “stable monetary background”. And so the Bank of Japan becomes the latest monetary policy-making body to introduce negative interest rates, in what has been a years-long yet curiously feeble battle by global central bankers to avoid sluggish growth, recession and deflation. [T]he BOJ said it will apply a rate of negative 0.1% to excess reserves that financial institutional place at the bank and introduce a three-tier system on rates. Weak global aggregate demand has left worldwide manufacturing with superfluous capacity, commodities markets flooded, while the ongoing pervasive capital glut shrinks investor returns. Major economies are in deflation, or exhibiting microscopic and sinking inflation, as measured. Yet to read literature from the U.S. Federal Reserve or the Bank of International Settlements is like entering an alternative universe in which there are only three topics: inflation, inflation past, and inflation future. On Jan. 27 the Fed issued its 520-word FOMC policy statement, with the word “inflation” in it 11 times, and “prices” five times. That’s actually less monomaniacal than usual; last August at the annual Kansas City Fed inflation-fest in Jackson Hole, Fed Vice Chair Stanley Fisher used the word “inflation” 75 times, and the word “price(s)” 31 times in a speech of barely 2,000 words. 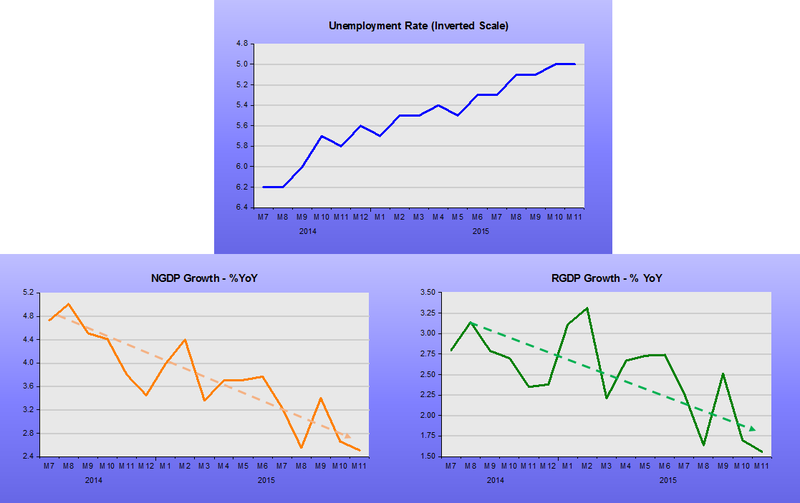 The word “growth” appeared three times, and “unemployment” eight times. Inexplicably, the Fed is promising a tighter monetary policy. The world’s major central banks need to meet quickly, summit-style, and in unison agree to promote national and global nominal GDP growth going forward for five years, whether by interest-rate cuts, quantitative easing or any means necessary. I would suggest national targets of 7% NGDP growth, possibly higher in India and China. For the next five years, the primary goal of global monetary policy should be economic expansion, while “fighting inflation” is put on the back burner. Frankly, with so much global excess capacity and competition, I doubt inflation will amount to much anyway. Yes, there are structural impediments galore in the global and national economies. There always will be, that is the nature of government and man. But for independent central bankers to put a monetary noose on the global economy and then to issue sanctimonious sermonettes about inflation and better government is intolerable, especially in light of polemical political movements in most of the developed world. Central banks cannot suffocate the world into political stability and free markets. Print more money, and a lot of it. PS I hope the Western experiment with the “independent central banker” is coming to a close. I want to vote for better monetary policy—is that not the nature of democracy? According to the UK Office for National Statistics (ONS) the reason for the heavy downward revisions to UK NGDP are due to heavy downward revisions to the implied GDP Deflator. 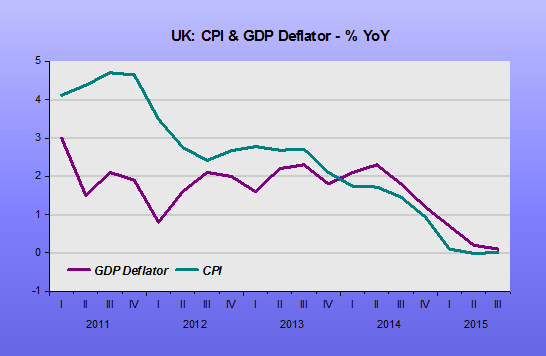 The deflator is “inflation” as measured for national income statistics. It broadly follows the unreliable, because never revised, UK CPI figures that the BoE tries to manage. The deflator is unreliable too, but at least mistakes are corrected! This time, to be fair, it looks as though the GDP Deflator has been revised down, bringing it into line with the collapsing CPI. Which is “right”, who knows? One suspects that there are a lot more resources at the resource-strapped ONS put into the politically sensitive CPI than the GDP Deflator. Over time the two indices broadly follow each other. 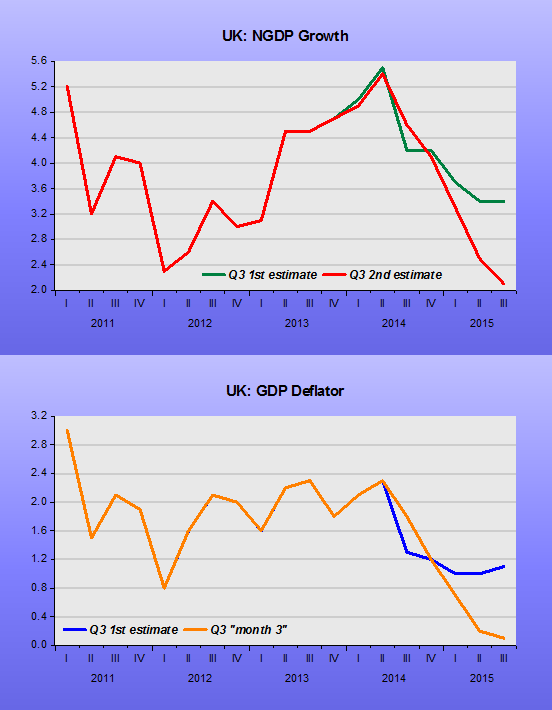 What is undeniable is that the UK is flirting dangerously with deflation. Nominal GDP remains around 2% or so, confirmed by today’s UK GDP releases, leaving zero room for monetary policy errors. It seems as if the UK is not making them, unlike the US, but do the policy makers at the BoE really understand how close they are to disaster? It doesn’t seem so. The culprit remains the same at all the big four central banks, asymmetric inflation targets. Despite protestations of symmetry the tightening bias is plain for all to see whenever CPI is expected to rise to 2%. I need to apologise. On 23rd December I was asleep on the job of monitoring UK NGDP. Having posted in October on the collapsing proxy for UK NGDP in 3Q15, “Nominal GVA”, and then posted again in November on the first estimate release of actual 3Q15 NGDP, I had not thought to check on the second estimate release for NGDP. Only today when preparing for the release of the UK’s first estimate of 4Q15 RGDP tomorrow and that NGDP proxy, “Nominal GVA”, did I look at that second estimate of 3Q15 NGDP released just before Christmas. Well, it was quite a shock. 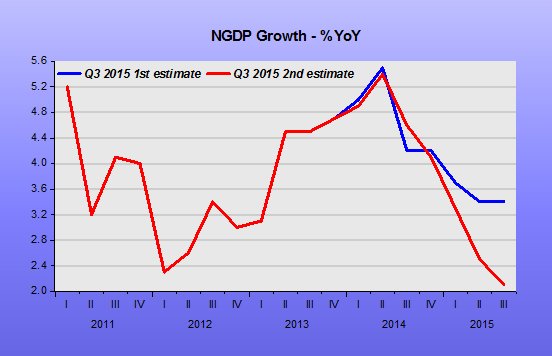 The data, charted here, shows that NGDP growth has been revised down considerably. No wonder the UK has seen steady stream of emollient commentary from the grandees of the Bank of England’s rate-setting Monetary Policy Committee, even our least favourite hawk chimed in this week. No wonder UK tax revenues are disappointing, it’s not just tax dodging Google or inevitable societal reactions to excessively high VAT rates. No wonder nominal wage growth has been disappointing for a few months. A very weakly growing nominal economy is responsible, as we suspected. This is awful. It is the Bank of England’s responsibility to ease now. All that talk of a rate rise coming into view at the end of 2015 has done enormous damage, motivated by Carney and his friends asymmetrical inflation targets based on ceilings, a new central bank orthodoxy in place at the Fed and the ECB. This inflation-phobic stance needs to be changed as a first step, by moving to properly flexible, symmetrical, ideally level, inflation targets. 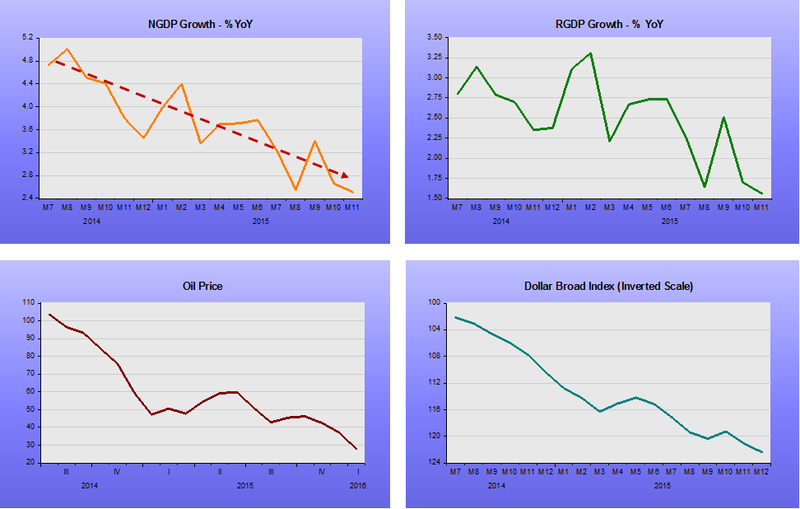 Better to move to NGDP growth expectations targeting. The perfect illustration of working with problematic historic data is well illustrated here, although we had said that 3% NGDP growth was worryingly low. George Selgin, free banker, and one of the most intelligent and enjoyable luminaries in the entire econo-blogo-sphere, took issue with a December 20 post of mine, Zombie Economics Will Never Die. Mostly, I am flattered Selgin even read my post, which reviewed a former Federal Reserve employee Daniel Thornton’s piece for Cato Institute entitled, Requiem For QE. As a preface, let me confess I am a fan of QE, and think the Federal Reserve’s failing was that it employed QE timidly; not open-ended until QE3; never vowed that the Fed balance-sheet increase would be permanent; and, yes, QE was somewhat compromised by interest on excess reserves, as suggested by Selgin and Thornton. “Benjamin, this is not a fair post, for all kinds of reasons, but mainly because many of the criticisms you offer are quite unrelated to the claims actually made in Thornton’s paper. For example, when Thornton claims that QE may have resulted in some unsustainable asset price developments, you observe that there were booms and busts before QE–as if Thornton’s statement amounted to a denial of that fact! You treat the fact that housing starts are still below their level during the last boom as clear proof that Thornton is crazy to imagine that QE has provided excessive stimulus to the housing industry–as if forgetting about all the overbuilding that the last boom entailed. Okay, let’s try to answer Selgin. Asset prices. After QE, the U.S. stock market recovered, eventually getting back to historic norms of 20 times earnings, and then flattening in the last year or so. This is during a time of undisputed all-time-record-smashing corporate profits, both relatively and absolutely. It’s been yuge. As an EMH fan, I tend to think the “market is right.” Is 20-times earnings “unsustainable,” as Thornton suggests? Seems in the ballpark to me. Did QE cause stock p-e’s to move back to historic norms? Or did the huge profits, and a seven-year (painfully slow) recovery? What would EMH say? Commodity prices. Thornton’s actual statement is that QE “caused a marked change in the behavior of commodity prices.” Oh, Heavens to Mergatroy, what does this even mean? Commodities have, in general, been declining since QE, especially since QE 3. Printing money causes commodities prices to dump? Gee whiz! Actually, commodity prices are set on global stages, and are influenced by China demand, shale-inspired oil gluts, the U.S. ethanol program, new technologies and who knows what all. History shows commodities booming long before QE. Thornton’s opaque thundering is like so many other foggy dire predictions on QE, along the lines of “Yes, the other shoe will drop—just you wait.” If Thornton has a specific observation about global commodities prices and Federal Reserve QE, let him state it clearly. And again, I defer to EMH: I think commodity prices are what they are, due to global market forces. Housing and Overbuilding. Okay, real estate and housing prices have somewhat recovered to 2008 levels, along with the general economy. If QE helped, then I say good for QE. But I would implore George Selgin to read Kevin Erdmann’s blog, Idiosyncratic Whisk, for a while. In general, due to ubiquitous and highly restrictive property local zoning laws in the U.S., the supply of housing is crimped, especially where people want to live (NYC, SF, L.A., Silicon Valley, etc.). Naturally enough, the pervasive artificial constraints propel house prices north (and then feeds into the CPI, PCE). I go further than Erdmann, and ask, “Where is the single-family detached neighborhood anywhere in the U.S. that embraces high-rise condos, ground-floor retail and push-cart vending?” And again, I defer to EMH. Real estate developers built housing as consumers and apartment house owners were buying housing. The Fed caused a deep recession, fighting phantom-bogeyman So housing (leveraged, btw) did not sell. The nation never went through a period of national residential overbuilding, and indeed remains undersupplied in various markets, due to popular structural impediments (property zoning). Well, enough of this. The genesis and understanding inside the Fed regarding QE may be tortured, and uncertain (well, it is the Fed). And I grant to Thornton, and Selgin that IOER is mysterious, and may reflect a type of industry capture of a regulatory agency (the Fed, in this case), or the Fed’s hysterical squeamishness about inflation. To me, QE is money-printing and the monetization of national debt, and I am unabashedly for it. I would like to see QE married to FICA tax-cut holiday, with the QE-purchased bonds placed into the Social Security and Medicare trust funds. Whenever the economy slowed, this would trigger a FICA tax holiday and money-printing. PS The question is sometimes raised if QE worked at all to stimulate the real economy, and I think it did. Of course, if QE raised asset prices, that had some positive effect, perhaps most in property, in which rising values lead to employment-generating restorations and sales work. There is probably another mechanism that I have never seen alluded to: Most individual and small businesses can only borrow against collateral, and that universally means real estate. (As a small business operator myself in years past, I knew this, and borrowed against my warehouse). Ergo, rising real-estate values increase the borrowing capacity of small businesses. If QE boosts real estate (as Thornton says) then it boosts the borrowing capacity of job-generating small businesses, too. Of these four categories, only #4 would be inert (yes, banks were sitting on deposits), the other three actions would be stimulative. Conversion to cash may be inert if hiding under mattresses, but likely that money is circulating. BTW, cash in circulation is perhaps not trivial; there is $1.41 trillion circulating today, up from $820 billion in 2008. As long as inflation is dead, expect cash in circulation to expand rapidly, becoming increasingly useful for savings and tax-free transactions. The end-result of this no-inflation-induced burgeoning cash and underground economy is not pretty: Think of a Grecian Banana Republic. Only suckers pay taxes. PPS It is a canard to define QE as “as swap of bonds for reserves.” The creation of reserves happens after the bondholders who sell into QE who in effect receive freshly digitized cash. The bondholders sell to the 22 primary dealers, and it is the primary dealers who sell to the Fed, and then receive payment from the Fed into their commercial bank accounts. Those Fed payments are counted as reserves. So, to be clear, bond-sellers received $4.5 trillion through QE and primary dealers also received $4.5 trillion. We do not know what the bond-sellers did with their fresh cash. And to George Selgin, I say—can we just have a beer and watch the Super Bowl instead? Sorry, one last PS: If the Fed is so easy, why is the US dollar stronger now against a trade-weighted basket of currencies than before 2008? 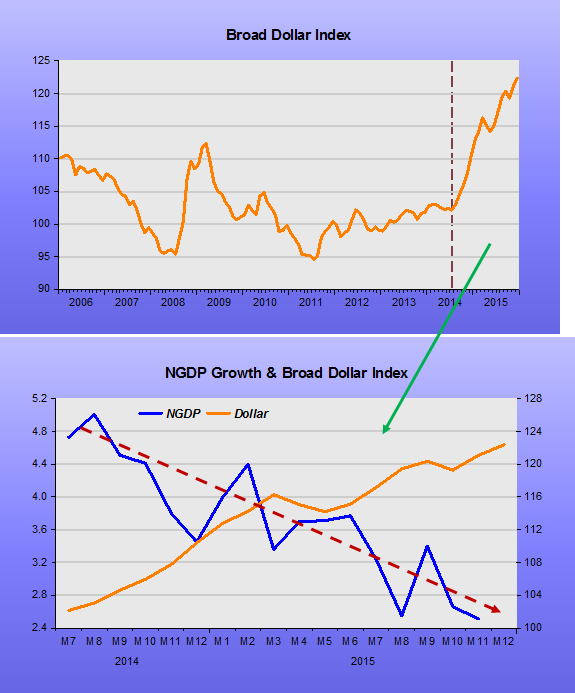 And note that the dollar appreciation since mid-2014 goes hand in hand with falling NGDP growth, a sure sign of monetary policy tightening. Mervyn & Marvin botch it! They provide some severe and justified criticism of the majority’s policy, but they unfortunately start their evaluation by making two serious mistakes, which are discussed in this post. [T]he response of the Riksbank to the rapid recovery of the Swedish economy from the global financial crisis – which entailed raising official interest rates from 0.25% to 2% between June 2010 and July 2011 – was broadly accepted by all members of the Executive Board, and appears not unreasonable in the light of all the information available to the Riksbank at the time. You can read Svensson´s detailed critique. I´ll just show charts that indicate monetary policy was dismal after mid-2010. The NGDP & Trend chart shows that Sweden, outside the Euro and with a floating exchange rate was quickly coming back to trend after the policy mistake of 2008 (which was a common feature to most central banks). The rate decision after mid-2010 was a gross mistake. Why did they do it? Once again the oil price effect and worries about real estate bubbles! 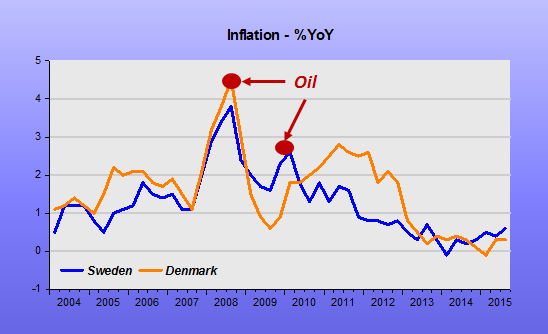 Meanwhile, neighboring Denmark, outside the Euro but linked to it by an exchange rate peg, did not do so well, getting clobbered by the brilliant Trichet decision of raising rates twice in 2011 (April and June) also because of oil price effects. When the Phillips Curve idolizers get tricked! By paying attention to the very “top”, they miss the “tumbling action at the bottom”! And firmly believe that what´s (temporarily) constraining inflation from climbing to target is the behavior of oil prices and the dollar!